"I came up with this recipe when I was looking for a recipe for French toast that I could make in the slow cooker. 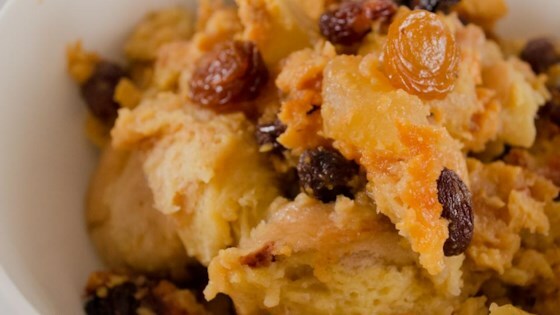 Some people will say this is more of a bread pudding, but say what you will. This is delicious!" Grease the inside of a slow cooker. Place apple pieces in the prepared slow cooker. Sprinkle brown sugar over apples and top with butter slices. Beat eggs, milk, vanilla extract, and allspice together in a bowl with a whisk until smooth; add raisins. Mix bread pieces into egg mixture until bread is saturated. Pour bread-egg mixture into the slow cooker. Make this easy French dip in your slow cooker. Heavy whipping cream can be used in place of milk if desired. This was sooo delicious! It was my first slow cooker French Toast so I wasn't sure what to expect but it was great. I used Ezekiel cinnamon raisin bread and almond milk in place of regular. Made this multiple times for brunches, and it’s always a big hit. Have to make it the night before, letting it soak up overnight. I do two apples to fully cover the bottom of the crockpot. This was good, I increased the apples and we ate with ice cream, more like a bread pudding. Easy to toss in crock pot before making dinner and then have dessert ready.